Bear Creek Campground opens April 29, 2019! 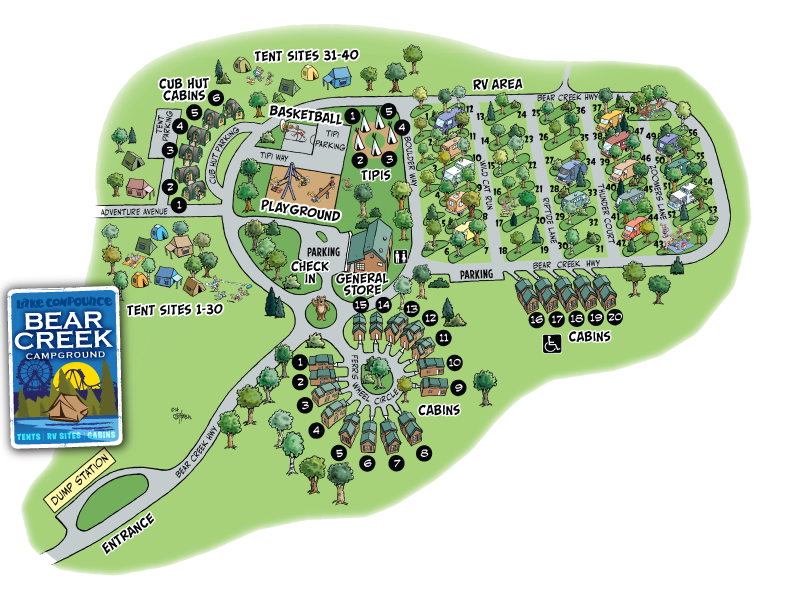 Bear Creek Campground is a one of a kind, family camping experience located steps away from Lake Compounce Family Theme & Water Park. 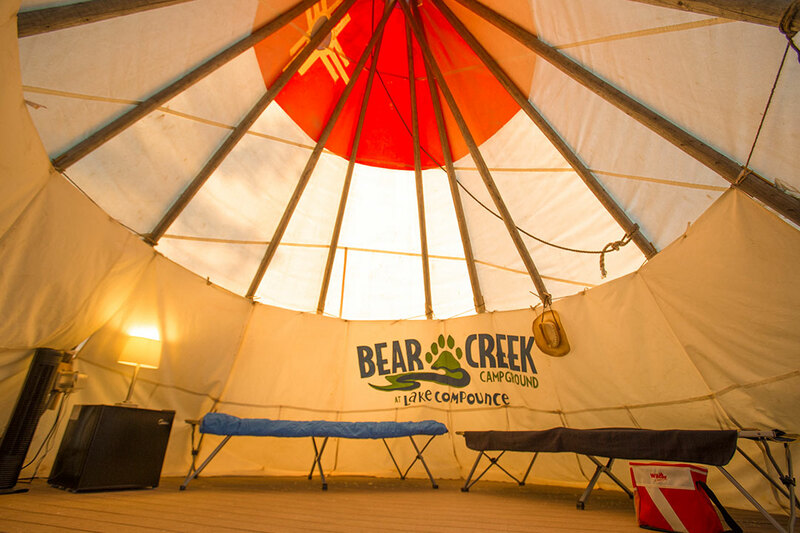 Bear Creek provides one-bedroom cabins, two-bedroom cabins, cubhuts, tipis, RV spaces and tent sites. 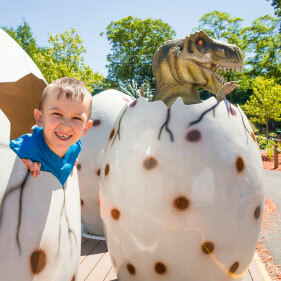 A list of themed weekends and activities can be found under our features and activities tab. Stay & Play Packages are Back! Book your two night unforgettable adventure at Bear Creek Campground and receive 4 Bronze Season Passes, $120 in Midway Moola, and $40 in Game Bucks! Book Your Stay & Play Package Now! All sites include Wi-Fi, picnic table, fire pit, transportation to and from Lake Compounce Family Theme Park. 6 person pre-assembled tents, no set up required! and 3 night minimum on holidays. * 1 BR/ADA Cabin price is intended for a maximum of 5 people. 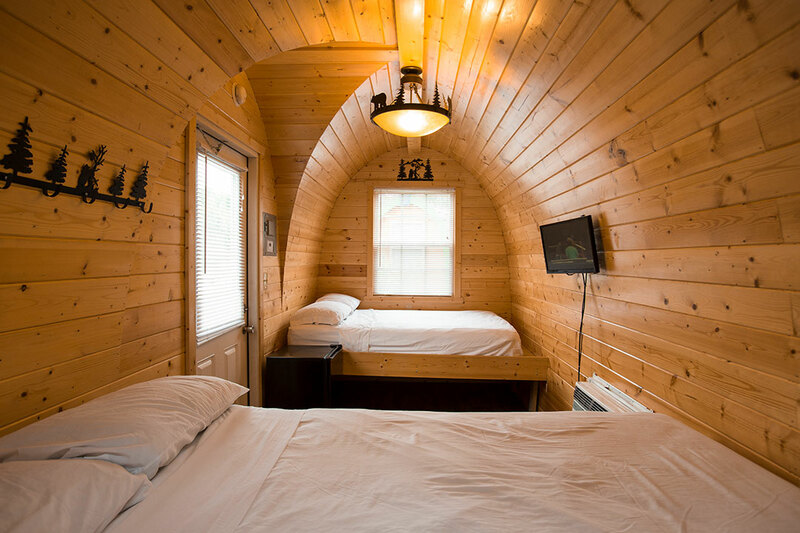 1 BR/ADA cabins have two full size beds with a cot available for the additional person. Guest is responsible for the bedding, sheets, pillows and towels for the additional person. ** Two Bedroom Cabin price is intended for a maximum of 8 people. 2 Bedroom Cabins have enough beds for 6 people, with a loft that can accommodate 2 children. Guest is responsible for the bedding, sheets, pillows and towels for the additional 2 people. 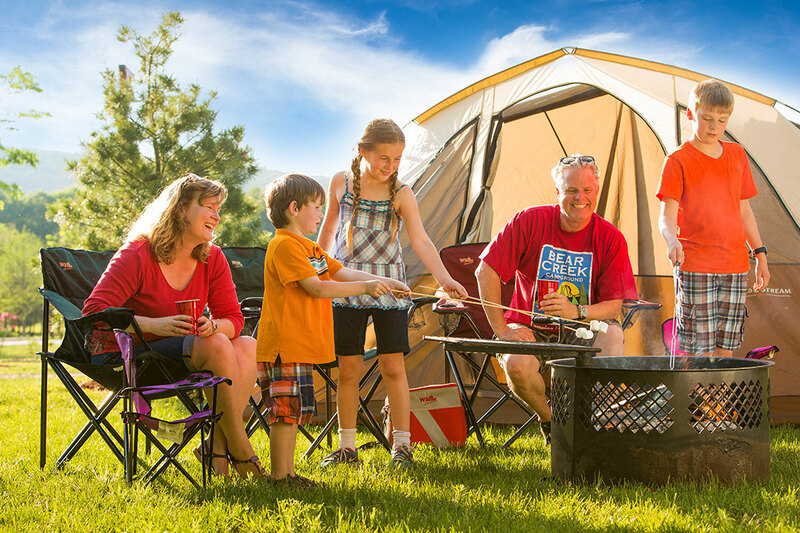 When You Camp at Bear Creek, Save at Lake Compounce! 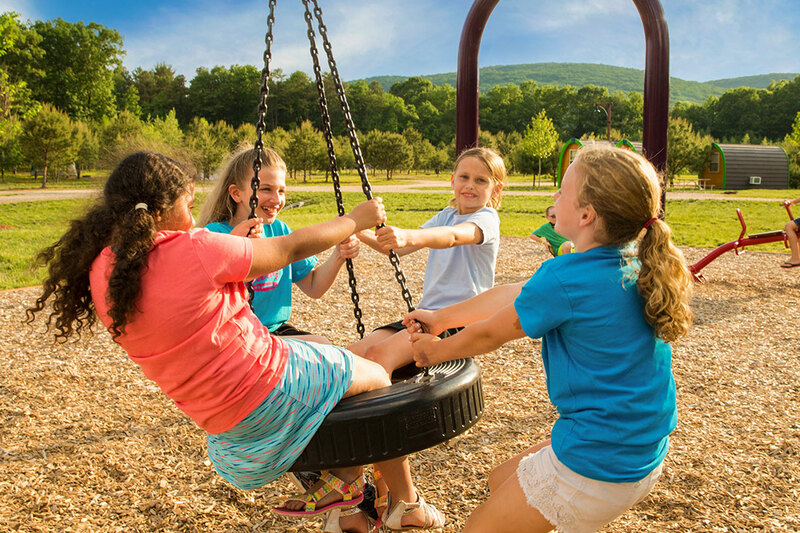 Complement your stay at Bear Creek Campground with a visit to Lake Compounce Family Theme Park. Discounted Ticket Pricing: 2 Day passes - $43.99 +tx | 1 Day Passes: $35.99 | Season Passes: Click Here! *NOTE: Tickets are only valid during the summer and does not apply during October or the Haunted Graveyard. * Two Bedroom Cabin price is intended for a maximum of 8 people. 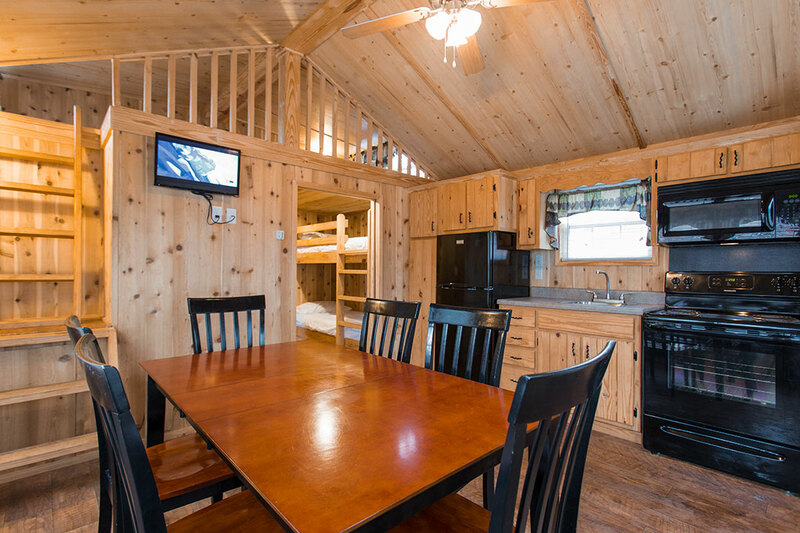 2 Bedroom Cabins have enough beds for 6 people, with a loft that can accommodate 2 children. ** 1 BR/ADA Cabin price is intended for a maximum of 6 people. 1 BR/ADA cabins have two full size beds with cots available for the additional 2 people. 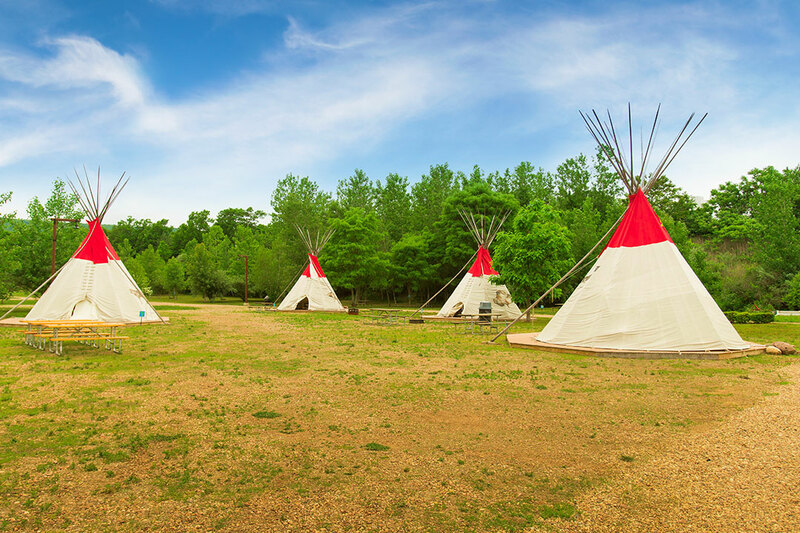 Please Note: Two night minimum on weekends and 3 night minimum for holidays for Deluxe Tipi’s, Cub Hut’s, 2BR Cabins, and 1BR/ADA Cabins. Save 10% at Bear Creek when you become a Good Sam Member! Do you qualify for any of these great savings? Select them on the Discount drop down box at checkout! For a Detailed List of May Activities Click Here! Bear Creek welcomes you and your family back for our 6th season! Join us for opening weekend as we engage in some fun arts and crafts and movie nights! Happy Mother’s Day to all of the wonderful mothers out there! To show you how much you are appreciated, our Bear Creek Campground staff will provide a Mother’s Day pancake breakfast where your children will help decorate your pancakes! Also, join us on Saturday night for a wine and paint class! Mom paints for FREE! A weekend honoring our local heroes who keep our communities safe. Write thank you letters to local police officers and fire fighters, and participate in a police & firefighter kickball game! Wear a blue shirt to be on the police team or a red shirt to be on the fire fighter team! Some of our local heroes will even be at Bear Creek Campground to meet you! Looking forward to that three day weekend? Our Memorial Day Weekend celebration consists of a site decorating contest where campers are encouraged to patriotically decorate their sites for a chance to win prizes! The weekend will conclude with a flag raising ceremony, a bike parade, and of course no celebration is complete without ICE CREAM! For a Detailed List of June Activities Click Here! If we supply the s’mores, will you supply your appetite? This weekend our campers will explore the vast woods of Bear Creek Campground, partake in an hour of yoga, and maybe cook up a few yummy snacks along the way. Join us for a weekend dedicated to observing nature and learning how to survive as you camp with us! The perfect formula for a fun family adventure! Join us for the coolest hands on science activities! Grow your own rock candy, make icky slime and more! Be sure to practice your evil scientist laugh for a most memorable weekend! Spend time with Dad on his special weekend! Father’s day weekend features a lot of interactive activities including a Father Daughter dance in the Pavilion on Saturday night. The rest of the weekend will be filled with an array of arts and crafts for kids to create for Dad! Feeling reminiscent of past times? Worry no more with this creative way to visit different days of the past. From the groovy 60’s to the trendy 2000’s, travel with us across timelines and experience a beautiful blend of different cultures and lifestyles. C U there, xoxo -Kyle the Crocodile. Bear Creek Campground knows how to celebrate! Show us your pride all weekend by participating in our site decorating contest! Winners will receive exclusive prizes. And then on Saturday be sure to stop by Lake Compounce for a spectacular firework display over the lake! For a Detailed List of July Activities Click Here! The fun doesn’t have to stop when the sun goes down! A weekend full of radiating activities such as Glow-In-The-Dark Bowling, black light dance parties, fire-fly jars and more! Halloween is coming early this year to Bear Creek Campground! Dress up in your favorite costumes to go site to site trick or treating! Plus partake in our ghostly and ghoulish activities. The carnival weekend rolls into town the 19th of July this year. Carnival games, cotton candy, and even a dunk tank, join us for a good time at the fair! We know you’ve been nice this year, so Santa and his elves are making a pit stop at Bear Creek Campground. Not only can you get your picture taken with Santa in July, but you can also send him an early wish list! Remember to bring your boughs of holly and Christmas decorations to try to win our site decorating contest! For a Detailed List of August Activities Click Here! Come to Bear Creek Campground this weekend prepared to cool off and get soaked in our water themed activities! Compete against other campers in a friendly water balloon toss competition, water ring toss, a frozen t-shirt race and more! Can you name all of the planets in our Solar System?! After this weekend you will be able to! Set your sights to Bear Creek Campground for a weekend of space themed activities and an Aliens vs. Astronauts hunt! Who will rule the Galaxy? Join us this weekend for a magical experience as we explore the mysterious world of wizarding. Participate in our fun and creative spin on what it takes to be a wizard in the tri wizarding competition and create magical potions and spells along the way. Book your site today! Splash on down to Bear Creek! Join us for a Swell weekend of Under the Sea fun! Do we need to be more Pacific? Make your own Puffer Fish, participate in a Fish Bowl Ball Toss, and create your own Ocean Slime! You are Naut going to want to miss out! It may mean the unofficial end of summer, but there is still time to enjoy a relaxing, long, three day weekend at Bear Creek Campground! Sit by the fire, kick your feet up, and roast some marshmallows. Remember to bring some patriotic decorations to participate in our site decorating contest! Winners will receive some awesome prizes! Q: What time does Lake Compounce open? A: Our operating schedule can be found online here. Q: What is Bear Creek Campground’s operating season? A: Bear Creek Campground is open April 29, 2019 through October 29th, 2019. Q: When do we check in? Q: When do we check out? Q: What are the hours of the Camp Store? A: The camp store will open at 8am daily and close one hour after Lake Compounce closes. Please note fall and spring hours differ. Q: How do we get to Lake Compounce from the campground? How far is the campground from Lake Compounce? A: Lake Compounce is within walking distance (3/4 mile) of the campground; however we offer a tram service to and from the campground daily (May-September). Personal vehicles can be driven over to the Lake Compounce Parking lot without any additional charges. Q: What is included in the cabins? A: Cabins have a full kitchen and bathroom along with two full size beds and two bunk beds. There is a loft for children and young adults to enjoy in the two bedroom cabin. Cabins also include cable, Wi-Fi, Heat/Air Conditioning, linens for the four beds (no blankets or comforters provided) towels, shampoo and conditioner. Cabins will not include cookware or dishware. Q: What is included in the Tipis? Q: What is included in the Cub Huts? 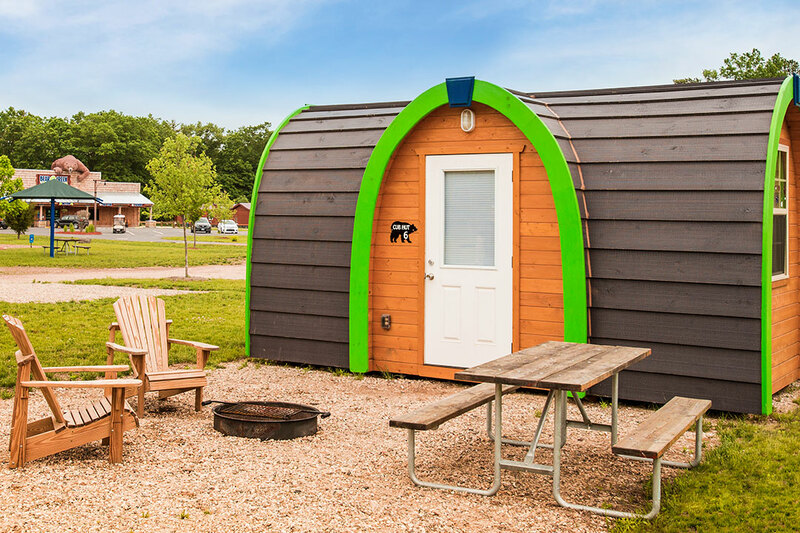 A: Cub Huts include two full sized beds, a mini fridge, Heat/Air Conditioning, cable TV, linens for the two beds (no blankets or comforters provided), close access to clean public restrooms, fire pit, and a picnic table. Q: Where can I buy Discounted Tickets? A: Tickets can be purchased at the Camp Store. Discounted tickets are not available during the Haunted Graveyard at Lake Compounce. A: We require a minimum of 7 days (for tents) and 14 days (for cabins) to cancel your stay and receive a full refund. If you cancel your stay after the deadlines there will be a $45.00 fee assessed. Q: Are tickets included in the rental of the site? Tickets are sold separately. We do have heavily discounted rates available. Discounted Tickets are not available for the Haunted Graveyard Walkthrough at Lake Compounce. Q: How do we book our stay? Q: Are there things to do at the campground itself? A: Yes! There will be events available from crafting to movie nights! (May – September). We also have many family friendly outdoor recreational activities to enjoy. Visit www.campbearcreek.com for a complete list of activities under the campground features and activities tab. A: Bear Creek Campground is open rain or shine. Lake Compounce only closes when there is heavy lightning in the area. There will be indoor events available until the storm passes at the campground. We do not issue refunds or rain checks. Q: Are there bathrooms located at Bear Creek? A: Yes! There are public restrooms available at Bear Creek Campground. They are complete with changing areas and showers. Q: Where is Bear Creek located? A: Bear Creek is conveniently located in central Connecticut about two miles from Exit 31 off Interstate 84. For GPS or Internet directions use 185 Enterprise Drive, Bristol, CT 06010. Q: Where on Lake Compounce property is the campground? A: It is located in the wooded area to the left and rear of the Lake Compounce Parking Lot. A: Unfortunately, firewood from outside the campground is not permitted per state law. However, we sell firewood at the camp store. Q: How many people does the cub hut accommodate? A: Dogs are allowed in the RV and tent sites only. They must be leashed and under control at all times. Note: Dogs are not allowed inside of Lake Compounce Family Theme & Water Park. Please remember to pick up after your pups. Q: Once I book, how can I obtain discounted tickets to Lake Compounce? Q: Is a 2-day ticket to Lake Compounce really only $43.99? Q: What is the schedule for the tram to Lake Compounce from and to Bear Creek Campgrounds? Q: I have a family of 5 and I noticed that the stay and play package for a cabin on a weekend includes a maximum of 4. How will that apply to my family? 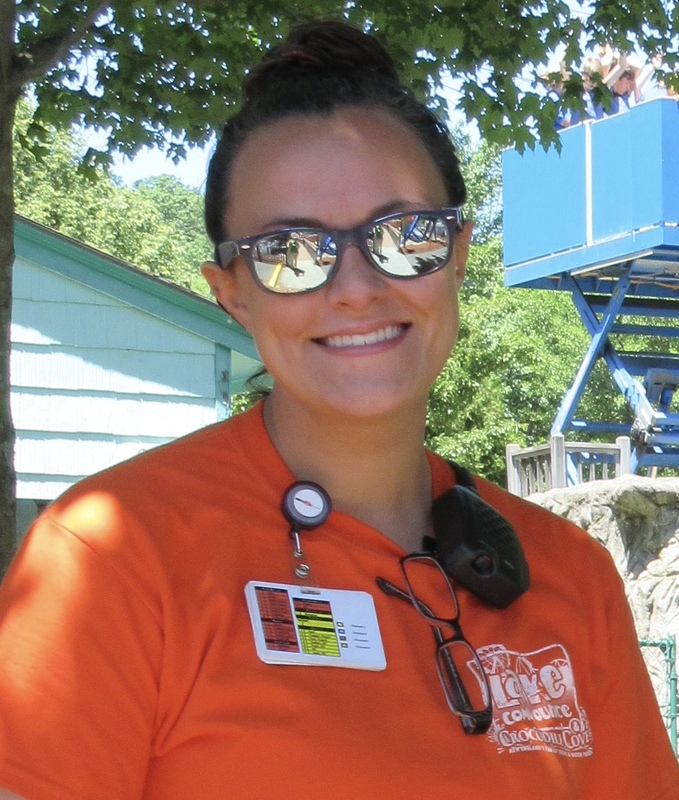 Q: I understand check in at 3pm but if I arrive early, am I able to retrieve tickets to Lake Compounce, spend the day there and thus check in after the park is closed? 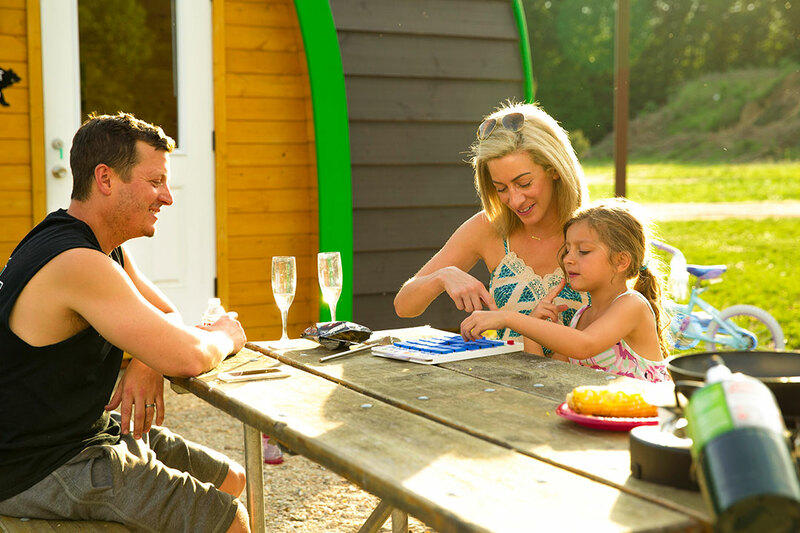 A: Yes, we can check you in, put you on a waiting list (we will call you when your cabin/cub hut/tipi is ready) so you and your family will be able to enjoy the park before check-in. Q: Does a ticket for Lake Compounce include access to Crocodile Cove?